The discussion about abandoning conventional cages in laying hen husbandry gained in momentum in 2008 when 63% of the voters in California approved the so-called Proposition 2 which would prohibit conventional cages from 2015 on. In addition, a law was passed which prohibited the import and sale of egg which had been produced in this housing system also from 2015 on. Because of the possibility that similar ballots in other states might have the same result, United Egg Producers, in co-operation with the Humane Society of the United States, the leading animal welfare organisation in the USA, in 2011 tried to pass a law in the US Congress, the Egg Bill, which would have regulated the transformation to alternative housing systems. The bill did not pass Congress in 2013. The discussion began to gain in importance in April 2016 when several food retailers and restaurant chains published statements in which they declared that they would not sell or use eggs produced in conventional cages from 2022 respectively 2015 on. Until April 2017, 219 companies published similar declarations. If their plans would be realised, over 71 % of the U.S. layer flocks would then be needed to produce the annual demand of almost 72 billion cage-free eggs. Leading egg producing companies began to build large cage-free farms or to restructure older farms, even though this was less important. One of these new farms is located in Bogata (Texas). Bogata, a small community with less than 1,100 inhabitants, is located in the fertile Red River valley in northern Texas. Farmers grow corn, soybeans and cotton. Until 10 to 15 years ago, Bogata was a central city of some importance. But when a new highway was built and with the increasing mobility of the inhabitants, it very fast lost this function and the Main Street degraded. The decision of Cal-Maine and Rose Acre, the two leading egg producing companies in the USA, to build a layer farm with 1.7 mill. layer places, was like a struck of luck. About 100 new jobs were created and the community began to recover. Plans to build the farm started in 2014 and towards the end of the year, construction began. The farm is a joint venture of the two companies. They decided to build a cage-free farm together as both companies had no experience with cage-free laying hen husbandry. They planned to test two different housing systems and then decide which would better fit their further plans. The location was selected because of a rather central position in the USA and of the excellent traffic infrastructure. Other aspects where the fact that no poultry farms existed nearby in the valley and that feed could be bought from adjacent farms and the dry manure be delivered to these farms. In total, the farm consists of seven houses with 240,000 places each (Photo 1). In addition, two pullet farms were built in a distance of about one mile. The farms will be able to supply the layer farms with the needed pullets. At an age of 16 weeks they are transferred to the layer farms. The available space for white hens in the layer farm is 930 cm2 and 1.116 cm2 for brown hens. 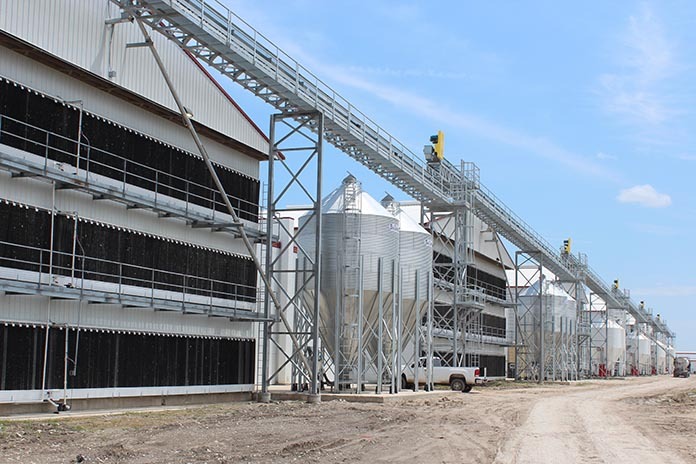 The feedmill will be completed by the end of this year and have a weekly capacity of 2,700 t. So it was still necessary to haul the feed by truck from Sulphur Springs to the farm over a distance of 65 km. 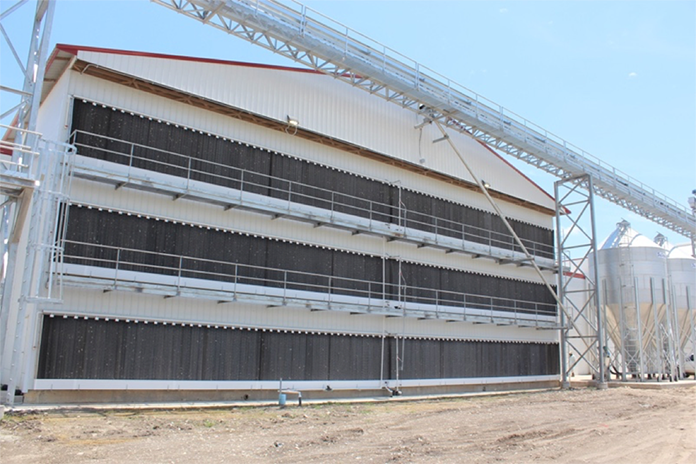 Once the mill will be in operation, the feed will be transported to the bins in front of the single houses by conveyor belts (Photo 2). In the barns, two housing systems are used; one from the Italian company FACCO and one from the German company BIG DUTCHMAN. The barns have three stories. In each story aviaries with three layers are installed. The barns are about 40 m wide, 16 m high and 160 m long. Horizontally they are divided in ten units, each 16 m long. This is necessary to keep the hens from piling up at the cooler end of the barn. The temperature at the end with the evaporation coolers (Photo 3) was between 22 and 24 °C, at the other end where the huge vents are located (Photo 4) it was about 3 to 5 degrees higher. A very comfortable climate inside compared to the almost 40 °C outside. In October, when the outside temperature decreases considerably, the ventilation system could be shut down during the night hours. On the premise, the processing facility is connected online with the layer houses. Here the eggs are washed, graded and packed. A packing in units of 6, 12 and 18 eggs is possible. White eggs can be separated from brown eggs and the eggs can also be processed separately for the two owners. The majority of the employees are working here. The farm manager and the production manager confessed that the handling of the cage-free systems had been a challenge in the beginning but did no longer cause problems. The customers demand that twice a day the whole farm has to be inspected story by story and aviary by aviary. This is time consuming but guarantees an excellent overview on the situation of the flocks. 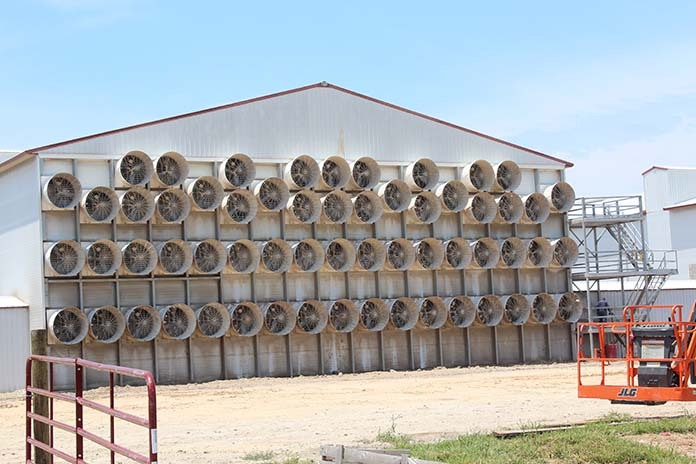 Feed conversion and mortality were higher than in farms with conventional cages. When visiting the farm, 3.5 pounds (1,6 kg) of feed were needed to produce a dozen of eggs which equals a conversion rate of 1.9 to 2.0. Because of the lasting low egg prices in the USA, the production costs could not be covered by the market prices. This is the reason for not building a similar farm in a distance of 25 km despite the building permission. The project will only be started when profits can be expected. The eggs are marketed through the headquarters of Cal-Maine (Jackson, Mississippi) and Roses Acres (Seymour, Indiana). When visiting the farm, it was not possible to market all eggs as “cage-free”, as the demand for such eggs was lower than production. Obviously, consumers were not willing to pay one cent more for these eggs compared to the price for eggs produced in conventional cages. 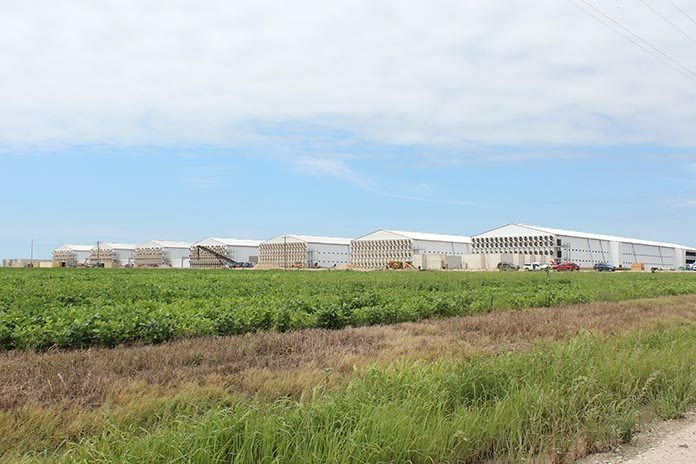 After visiting the farm, the Author could discuss recent problems of the U. S. egg industry with representatives of Cal-Maine and the vice president of the Texas Poultry Federation, James Grimm. One major problem in their opinion is the un-coordinated transformation to alternative housing systems and the lack of a nationwide valid definition of “cage-free”. Presently, the installed systems are only certified by the customers who purchase the eggs. This is a high risk, they declared, because other customers may not accept the system as cage-free. A second major problem is the high oversupply of eggs resulting from the building of large new non-cage farms without closing down older farms with conventional cages. Regarding the extremely low prices at farm gate, it would not make sense, however, to close the old farms because production costs were considerably lower with the old system. Nevertheless, such a step would be necessary to bring production and demand into balance again, was their unanimous statement. The observed reduction of placed hatching eggs was a first positive indicator. A stabilisation of the egg prices was not expected by them before the second quarter of 2018. Windhorst, H.-W.: Cage-free heißt das Zauberwort. Ausstieg aus der Käfighaltung in den USA steht bevor. In: Deutsche Geflügelwirtschaft und Schweineproduktion 68 (2016), Nr. 27, S. 3-5. Windhorst, H.-W.: Ist das Chaos vorprogrammiert? USA: Umstellung der Legehennenhaltung hin zu käfiglosen Alternativen. In: Deutsche Geflügelwirtschaft und Schweineproduktion 69 (2017), Nr. 19, S. 3-5.